As the flagship Marriott in Canada we have a proven track record of providing superior service in a relaxed atmosphere. With 459 deluxe guest rooms you will feel special in a four star hotel committed to your comfort. Our elegant and new Revive bedding package will leave you feeling revitalized! Situated in the heart of downtown Toronto and connected to the Eaton Centre shopping complex, we are within walking distance of shopping, theatres, museums and galleries. We boast JW's Steakhouse for elegant gourmet dining featuring delectable steaks and seafood. Also enjoy, our Parkside Restaurant for creative breakfast and lunch buffets overlooking the 19th Century Holy Trinity Church. For popular pub fare, visit our Characters Bar and Grill in a fun sports-minded atmosphere. For a quiet place to gather with friends for a cocktail or Starbucks be sure to visit our Lobby Lounge. 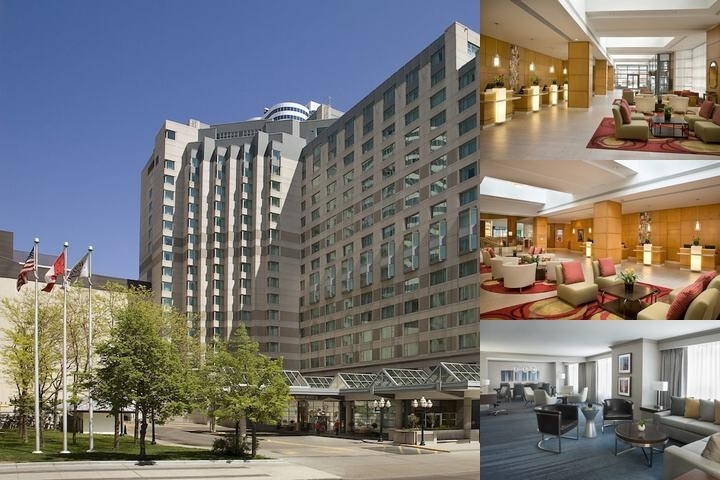 Hotel Features - The newly renovated, 18-story Marriott hotel invites all to experience a luxurious relaxing stay located in the financial district and adjoined to the Eaton Centre shopping complex. 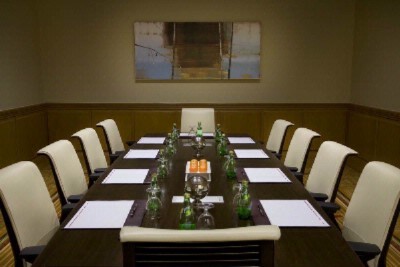 This gives business travelers and guests the pleasure of a convenient commute to any downtown destination. The atmosphere at the Toronto Marriott Downtown Eaton Centre is airy, hospitable, and beautifully decorated for guests’ comfort. With top service, all the assistance you need is right at the tip of your fingers. The hotel is just a short walk from theatres, sports venues, and limitless fine restaurants. Guest Rooms - Experience a peaceful night’s rest in one of the 459 contemporary, tech-savvy guestrooms. Each amply supplied room offers a surplus amount of amenities, a 32-inch flat-screen TV with premium cable channels featuring a plug-in panel that connects to any technological device, top-of-the line down pillows and comforter, complimentary high-speed wireless Internet access, a coffee maker, plush bathrobes, blissful bath products, and so much more! 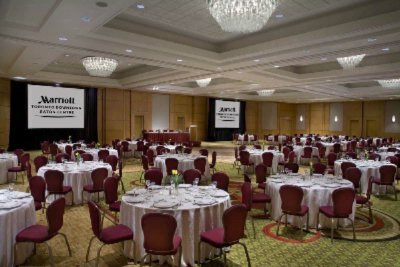 Amenities - Notable amongst hotels in downtown Toronto for special events and weddings, this downtown Toronto Marriott features over 18,000 square feet of graceful ballroom and adaptable meeting space with professional event planning staff on site. The recently renovated and chic Grand Ballroom presents an impressive 8,000 square feet of space; it can provide accommodation for up to 500 guests at a seated event or 850 guests for an upscale cocktail reception. Shock your taste buds with a fresh, zesty meal at the hotel’s Trios Bistro, get a full body workout in the new fitness room, or unwind at the scenic hotel pool located on the 18th floor, featuring an unmatchable view of Downtown Toronto. Nearby Attractions - The CN Tower, the Rogers Centre, the University of Toronto, Toronto General Hospital, Ryerson University and the world-famous shopping at Eaton Centre are within walking distance from the hotel’s doors. Also, recreational activity is in close proximity, including golfing, Pilates classes, tennis, ice-skating, golf courses, and a nearby running track. 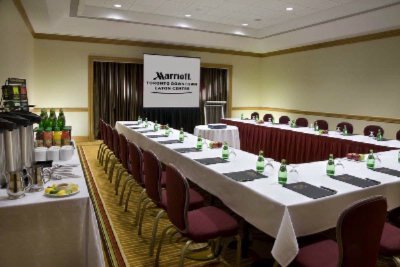 Below are the meeting, banquet, conference and event spaces at Toronto Marriott Downtown Eaton Centre. 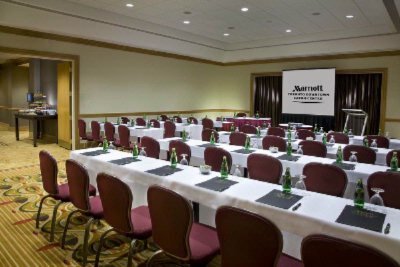 Feel free to use the Toronto Marriott Downtown Eaton Centre meeting space capacities chart below to help in your event planning. 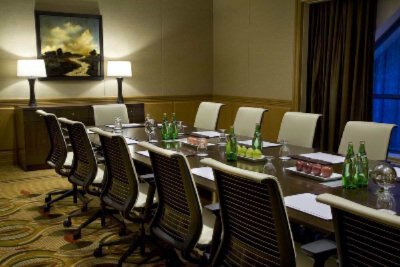 Hotel Planner specializes in Toronto event planning for sleeping rooms and meeting space for corporate events, weddings, parties, conventions, negotiated rates and trade shows. 123 x 56 x 15 Ft.
24 x 16 x 10 Ft.
30 x 17 x 10 Ft.
33 x 24 x 10 Ft.
27 x 24 x 10 Ft.
28 x 25 x 8 Ft.
124 x 34 x 10 Ft.
100 x 40 x 15 Ft.
48 x 56 x 15 Ft.
34 x 97 x 10 Ft.
48 x 28 x 15 Ft.
34 x 24 x 10 Ft.
34 x 73 x 10 Ft.
27 x 21 x 8 Ft.
34 x 49 x 10 Ft.
28 x 50 x 8 Ft.
34 x 25 x 10 Ft.
26 x 27 x 8 Ft.